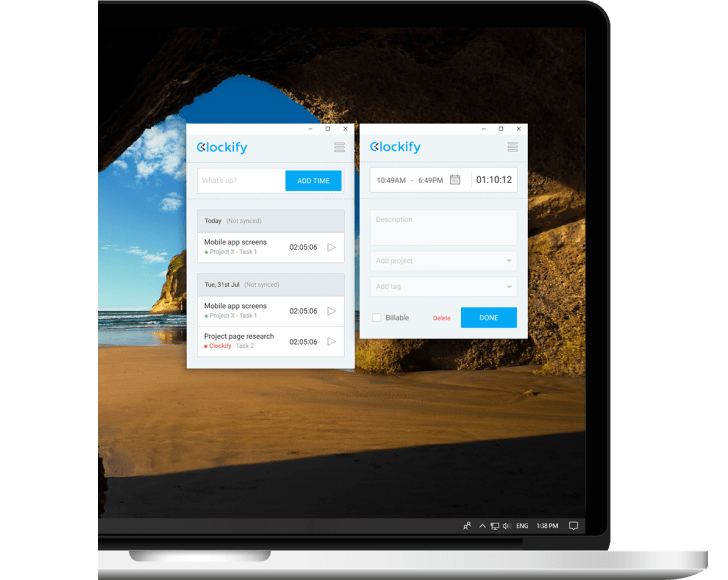 Clockify is the only 100% free time tracking app for Windows that lets you and your team log hours straight from your desktop while working. Clockify is a web-based time tracker and Windows-compatible time tracking software. It’s the only time tracking program that’s truly free, no matter how many projects you have or how big your team is. Clockify is primarily a browser app, but you can also install it on your computer as a Windows desktop app to make time tracking more convenient. 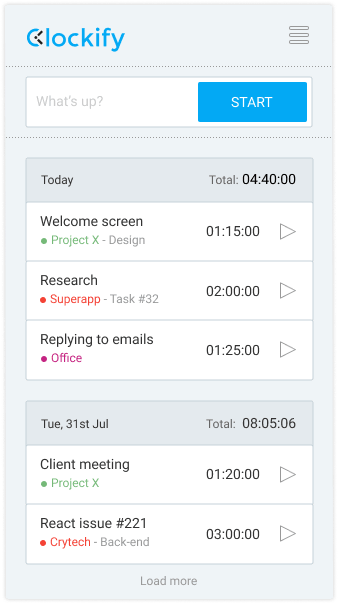 You can track how many hours you spend working on tasks from the Windows application, and then run reports, manage projects, and review timesheets in the browser version. When you start working, just click the button to start the timer. You can also continue timer for some previous activity. 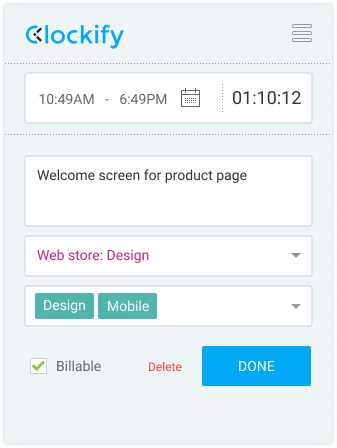 You can enter what you've worked on and add a project, task, tag, and billability status. Forgot to start the timer? Switch to manual mode and add how much time you've worked manually. 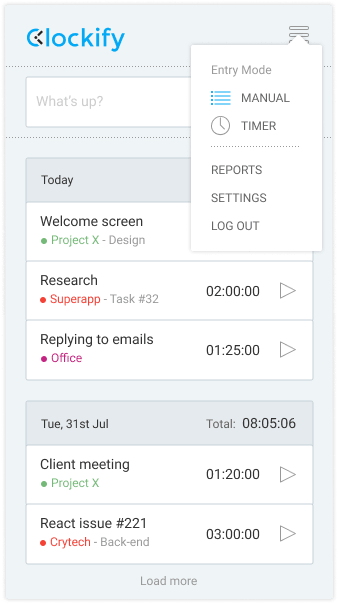 In the web version, you can review and export reports, manage projects, invite people, and review timesheets. Time tracking in the Windows app is quick and easy - all it takes is one click. 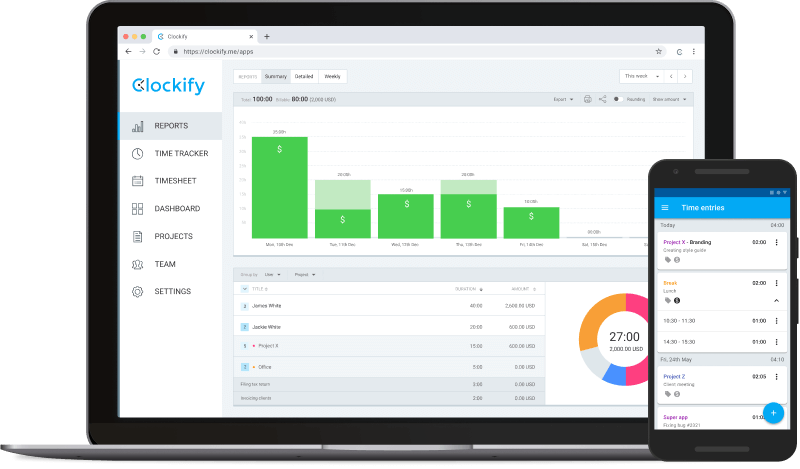 Clockify is the only time tracker that comes with premium features and unlimited users for free. Click "Start" when you start working and "End" when you're finished. Switch to manual mode and add how much time you've worked on an activity. Track time even if you don't have internet connection. Track time you spend working on projects and compare estimated vs tracked time. Start/stop the timer with a project already selected. Quickly fill in time details by using @project, #tag, and $ syntax. Get notifications when you forget to start the timer.